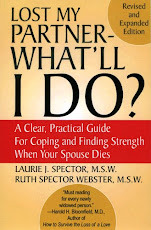 In part 1 of these excerpts from Lost My Partner – What’ll I Do? we discussed many of the common reactions you, as a survivor, may have experienced due to your late partner’s suicide. 1) Your spouse/partner exercised a choice and ultimately was the only one to have the power to act on that choice. If there was anger at you or anyone else, there were more effective ways he/she could have chosen to communicate feelings. 2) You are not to blame for something as complex as another person’s act of suicide. A multitude of factors, such as personality, self-esteem, family history, and the ability to deal with life’s stresses all contributed to your partner’s behavior. 3) You may be turning the anger you feel about your spouse/partner’s abandonment inward onto yourself. This can take the form of guilt and self-blame at being helpless to stop a suicide. It is not disloyal to be angry at people we love when their actions cause us pain. 4) A suicide note reflects only what your spouse/partner happened to be feeling at the time it was written. Try not to view it as a generalization about your entire past relationship. Look for more tips in Part 3.